A scene from the South Slough Estuary VFE. The students in background are preparing to do the data collection and photography needed to create this scene. Some of their notes appear by clicking on the notebook icon in the upper right hand corner. Many geoscience educators have used drawings and photos to help students understand geologic concepts. Today, thanks to advances in technology, faculty members can go further and build interactive, online field experiences for students (Piatek, 2010). 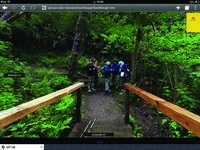 This can enable them to learn experientially from virtual field sites that would otherwise be inaccessible because of distance, time, or other constraints. 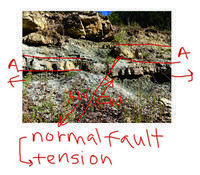 Student interpretation of a faulted section. Geoscience educators know the value of using field trips to reinforce concepts discussed in the classroom. We do it nearly every semester. 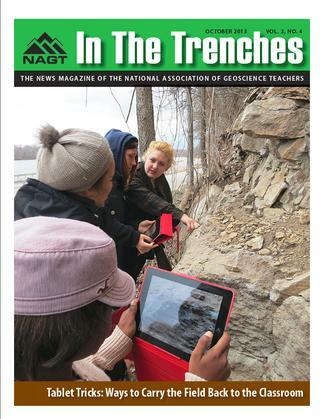 Nothing substitutes for placing one's hands on an outcrop and making observations (see cover photo). However, it is my experience that technology can help faculty teach and students learn as they seek to interpret the geologic history of an area, even in general education classes. I found it advantageous to have students using iPads instead of paper worksheets and clipboards for documenting observations, taking pictures and communicating results. My students did this on several field trips (two-hour and two-day trips) for my general education geology courses. The classes had enrollments of less than 16 students ranging from all freshmen to a mix of freshmen to seniors using iPads supplied by the college. Calls for greater accountability in documenting what students are learning are sweeping across institutions of higher education, and my university is no exception. We are increasingly being asked to demonstrate what, how well, and when students are learning core competencies for various degrees as part of decades-old academic program review initiatives. Some faculty members argue this attention to the academic aspect of program review is important; others debate the necessity of such requirements. 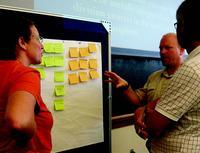 Participants at the 2012 InTeGrate workshop, Systems, Society, Sustainability and the Geosciences, discuss key concepts that can be used to teach sustainability. Preparing a workforce and citizenry to meet the resource and environmental challenges of sustainable future require the concerted efforts of everyone. Geoscientists, natural/physical scientists, social scientists, humanists, and engineers all play a key role in sustainability education. This is because the concepts and issues involved require systems thinking, synthesis, and contributions from all disciplines. Geoscientists, in particular, play an increasingly important role in addressing the extent to which humans can live sustainably on Earth. From water to energy, from climate change to natural hazards, geoscientists work on solutions to a wide range of challenges facing society. They must capitalize on the myriad opportunities facing modern society's ability to meet its needs sustainably. Incorporating sustainability topics into coursework is a stimulating and powerful mechanism for linking course content to real world issues. NAGT, the GSA Education Division, and CUR have announced the 2013 winners of their geoscience education awards. These awards recognize excellence in the k-12 classroom, in two- and four-year colleges and universities, and writing on the topics of geoscience and education. You can find out more about the various awards programs run by NAGT on the website. Information about the GSA ED Biggs Award is available on their website. This site aggregates the best advice and practical experience of early innovators in the use of GeoPads to make this information broadly available for faculty and students who are interested in integrating this technology into their own field-based teaching and research. The resources provide practical advice on selecting software and hardware, required preparation of faculty and students, accessing and formatting data, designing and implementing instructional activities, and logistical issues. In addition, "best instructional practices" in using GeoPads are described, including learning goals, expected outcomes, and assessment strategies. These sites and projects have developed materials and resources for conducting high-quality geoscience education in the field. Explore resources and teaching materials from SERC projects and collaborators that tie together scientific, social, economic, political, and/or ethical issues to teach about sustainability. These sites provide information and advice for tying sustainability concepts into a variety of settings and across the curriculum and promote an interdisciplinary approach to the way we teach sustainability-related topics in an effort to prepare our students for the complexities of living, working, and making informed decisions in the future and in illuminating the connection of these topics to their daily life. Volunteer at the NAGT Booth during GSA!